Modern cooperatives, whether they market agricultural products, operate a food store, or purchase hardware supplies, typically operate according to a set of widely recognized cooperative principles. 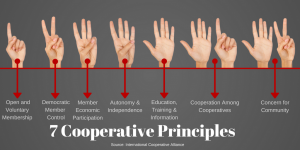 These “cooperative principles” tie cooperatives across the United States and the world together in a larger movement. Where did these principles originate? How did the cooperative model and movement develop? The cooperative principles recognized by the International Co-operative Alliance, and the broad cooperative community, are generally recognized to have originated from the efforts of 28 working men who founded the Rochdale Equitable Pioneers Society in 1844 and operated a cooperatively owned store that started out selling butter, flour, sugar, and oatmeal. The Rochdale Pioneers, as they came to be known, were working toward social goals that arose out of the conditions of their time, including harsh working conditions. Read more about the Rochdale Pioneers and their efforts on the website of the Rochdale Pioneer Museum. Watch this video commissioned for the Rochdale Pioneers Museum and the Co-operative Heritage Trust to learn more about the development of the Rochdale Equitable Pioneers Society. 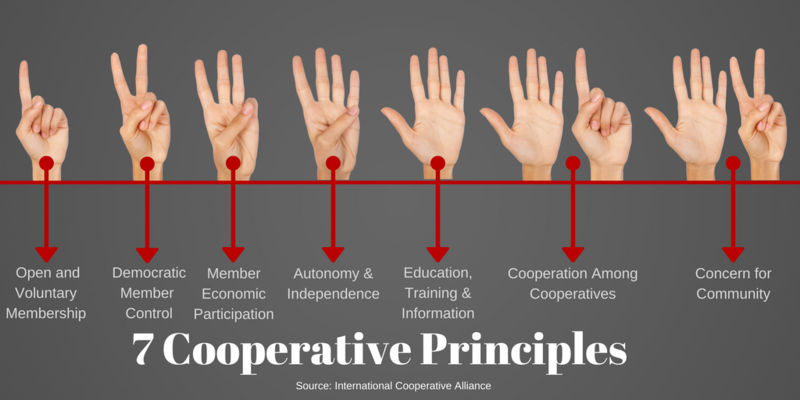 Today, the cooperative community recognizes seven core principles. Some cooperative scholars trace the history of cooperation much further than these efforts. Rather, they look to ancient social norms of mutual aid, such as the collegia of ancient Rome’s, the craft guilds of 11th century Europe, and the Ahi movement in Anotolia or what is today, Turkey. Ed Mayo’s short publication, “A short history of cooperation and mutuality,” provides a fresh perspective on these movements and the ways that they were influential in shaping the modern cooperative movement. In the United States, Benjamin Franklin helped to start the first recognized cooperative business, a mutual insurance company, in 1752. Agricultural cooperatives played an important role in the development of cooperatives in the U.S. with the first ag co-ops beginning operations in 1810 in dairy and cheese making. From 1810 until 1887, cooperatives were founded in many sectors of agriculture, including hog marketing, irrigation, fruit marketing, and cotton ginning, among others. The Grange, one of the first farm organizations in the U.S., organized cooperative development efforts while other farm groups like the American Farm Bureau and National Farmers Union were also instrumental to developing agricultural cooperatives. In fact, Farm Bureau helped to establish Growmark and Nationwide Insurance while National Farmers Union helped to establish CHS, Inc., the largest agricultural cooperative in the U.S. today.